The Coloradoan’s struggle to maintain identity amidst change. There were no stoplights lining the roads when Larry Fisher moved from Aspen to Pagosa Springs 35 years ago. Now, there are eight. “Whenever there is growth in a community, there are going to be advantages and disadvantages,” says Fisher, owner of Ski and Bow Rack, who relocated to the state’s southwest corner, in part for its low-traffic appeal. For small mountain towns that sit at the foot of ski resorts with world-class terrain and majestic views, the appeal is no mystery. Last year, Colorado hosted 21 percent of all overnight ski trips in the U.S., according to the Longwoods International Colorado Travel Year 2014 report. And compared to the previous year, there was an increase in visitors who traveled to Colorado for outdoor pursuits, as well as all-around touring, city trips and country-resort stays. For Ski and Bow Rack, a large number of customers are out-of-towners – many of them repeat visitors for several years running, Fisher says. Starting out as a tiny ski shop 35 years ago, Fisher’s year-round store is the state’s No. 1 dealer for hunting and fishing licenses. Besides fishing equipment, the shop’s retail includes gear for skiing, camping, mountain biking and archery – all personal interests of the owner that made their way into the shop over the years. Colorado travelers in 2014 pumped more than $18.6 billion into the economy and directly supported more than 155,000 jobs with earnings of more than $5.1 billion, according to the Economic Impact of Travel on Colorado report, released by Dean Runyan Associates in June 2015 for the Colorado Tourism Office. “An increase of the number of local people moving here and visitors has made things a lot easier on us, financially, so there are pluses and minuses to everything,” says Fisher, in light of the growth and development he’s seen over the past three decades. Most recently, the town’s first Walmart opened in Spring 2014 – which received some pushback from fellow business owners – as well as two new grocery stores as of July, spurred by long checkout lines and an influx of tourists. Reflecting Colorado’s tourism trajectory, the monthly lodgers’ tax in Pagosa Springs has increased every year since 2008, despite the economic downturn, no tax changes and no new inventory since 2009, according to Jennifer Green, director of Visit Pagosa Springs. The 2014 monthly lodgers tax represented a roughly 15 percent increase over the previous year. The state posted some record tourism numbers (with the exception of a decline in casino visits) in 2014. Colorado’s overnight visitors climbed to 33.6 million, an 8 percent increase from 2013, according to the Longwoods International 2014 Colorado Travel Year report. Day trips ­– travel to and within the state from locals and regionals – experienced a 12 percent uptick, reaching 37.7 million trips. An average overnighter stayed 4.6 nights (still lower than in 2000, when most visitors stayed for a week) and they brought more pocket change: Overnight travelers spent 19 percent more in 2014 compared to 2013, delivering a record $12.5 billion to the state. For communities such as Pagosa Springs, Crested Butte and Gunnison, tourism trends may be at the mercy of nature: Dry winters typically yield a drop in winter visits. But tourism remains both the strongest and most consistent industry in those communities. “Tourism is a major economic driver and primary industry for Gunnison County,” says Jeff Moffett, board president of Gunnison and Crested Butte Tourism Association. Gunnison’s Western State Colorado University and the 2 million acres of federal land are two additional economic pillars. For Gunnison County, summer vacationers eclipsed winter visits last year, which is especially notable given that Crested Butte’s strongest tourist draw has almost always been alpine skiing, Moffett points out. The shift could be attributed to a number of factors: Summer visitors spend roughly $800 to $1,000 per person, per visit. For the average winter traveler it’s double: $1,600. There’s also a wave of travelers seeking cooler temperatures to escape the heat of regional neighbors such as Oklahoma and Texas. Plus, it’s easier to travel into the valley in the summer by way of car versus airplane. Air travel is one obstacle that the Gunnison and Crested Butte Tourism Association hopes to improve. This December through March will feature the first direct flights from Los Angeles to Gunnison via Alaska Airlines, twice weekly. In 2014, domestic air arrivals to Colorado reached about 8 million for both visitors and residents, totaling 16 million, according to Dean Runyan Associates’ Colorado Domestic Air Travel Summary. Adding flights will bolster tourism and also help a community of second homeowners who live full-time in Southern California, Moffett says. While having no traffic lights was once an incentive, the biggest reason Fisher moved to Pagosa Springs was its friendliness. “On the whole, there’s a desire of people to go out of their way to help someone in need, and even though Pagosa has grown a lot since I’ve moved here, we really haven’t lost that,” Fisher says. Among the biggest challenges brought by growth and tourism is keeping up with the necessary infrastructure and amenities – such as public trash receptacles or signage – and for some, a concern of losing the community’s identity amid change. In the Crested Butte-Gunnison valley, the One Valley Prosperity Project worked with communities to help define a cohesive list of priorities in an effort to plan for the future. Grease up your bike chain. The Crested Butte-Gunnison valley boasts more than 750 miles of singletrack for mountain biking. To help wheelers navigate, a web-based mobile app launched in November 2014 with a set of 29 topographic maps that riders can download to their phones and take into the backcountry. If there’s no cell service, the phone uses GPS to link up the map. Currently in development, 3-foot by 4-foot trailhead maps will be created to match the app’s map designs, as well as 8-inch by 12-inch inset maps for trail junctions. 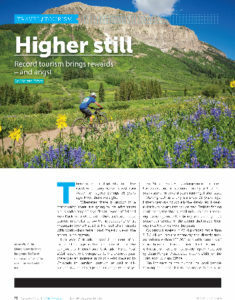 In partnership with the U.S. Forest Service and Bureau of Land Management, the Gunnison and Crested Butte Tourism Association jumped on board with two advocacy groups—the Crested Butte Mountain Bike Association and Gunnison Trails—to develop the valley’s integrated mapping system for singletrack, which will be the first-ever digital-physical approach of its kind to be established for mountain biking on public land in the entire U.S., said Laurel Runcie, Interactive Marketing Manager for the Gunnison and Crested Butte Tourism Association.